good and excellent work - as all of your works. thanks to share your stuff with the community. Which software did you use to make these realistic cliffs? 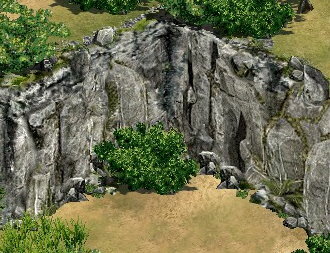 Great cliffs, but when I play them on my Forgotten Empires, not the HD version, they are surrounded by colours (red,blue,yellow...) and makes them stupid looking. Can someone tell me how to fix this? Extract the bitmaps with turtle pack, and import them again but uncheck the "auto selection mask"
That will fix it. I dont know why makes that error on the non HD version, but it takes 2 seconds to fix. Ca you upload the non-HD ones masked pretender?